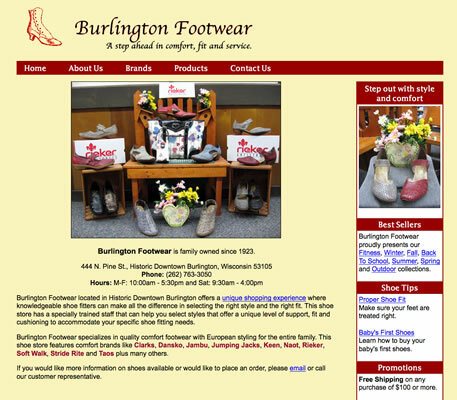 Burlington Footwear is a an independent shoe store. The owner wanted a simple website that lets people learn more about the store, what brands she offers and to invite them to come to the store. She wanted to showcase her shoes and emphasize the value of a traditional shoe store. To encourage people to come to the store, we decided to organize the shoes by season. Each season would showcase the shoes that the owner wanted to emphasize. Burlington Footwear has a vintage or historic design. Working with the owner, I developed the custom design, code and photos for the website. I choose colors and fonts that are consistent with vintage design. This website helps people to discover and learn what Burlington Footwear has to offer. The new architecture makes the website easier to update and maintain. Designer and Developer. I build websites and apps that are tailored to your goals and are easy to use. In my downtime, I enjoy reading, biking and photography. Follow @dbrensinger on Twitter for latest tweets. © 2019 DJ Brensinger All Rights Reserved. Professional Website Development By DJ Brensinger.